In a surprising and politically charged move, Ald. 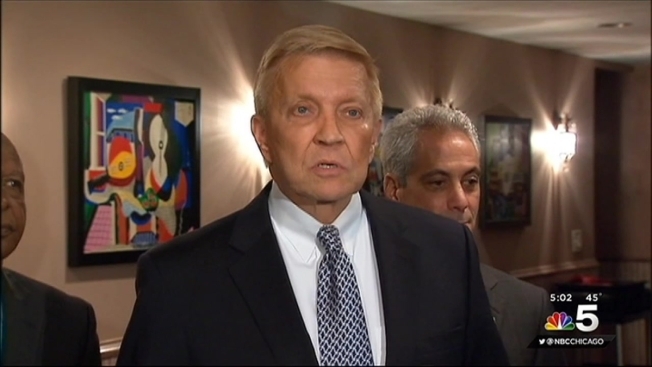 Bob Fioretti announced Sunday he would endorse Rahm Emanuel for mayor. The unsuccessful mayoral candidate, who was previously one of the most vocal critics of Emanuel, put his support behind the mayor in the name of city finances. "The No. 1 issue that we face in this election is the financial crisis that is a result of generations of Chicago and Springfield politicians kicking the can down the road. If that is the top issue -- and for me it is -- then we need a mayor that can deal with those problems," Fioretti said in a statement. Fioretti was a harsh opponent of Emanuel's leading up to the Feb. 24 election, and he used his opposition to the mayor as his own campaign platform. In January, he tweeted, "My vision for Chicago is entirely different than the mayor's. If you're happy with the way things are going, then welcome to the 1 percent." After talking to both Emanuel and Jesus "Chuy" Garcia following the Feb. 24 election, Fioretti remained neutral and chose not to throw his support behind either candidate. Two weeks ago, however, the alderman told Garcia supporters he would endorse their candidate. "It was crystal clear," they said. Fioretti's endorsement of Emanuel comes as a surprise to many who worked with him. Four people who worked closely with the alderman and the Progressive Caucus at City Council told NBC 5 they were "disgusted," "sad," "embarrassed" and "not surprised" by Fioretti's sudden endorsement. All four of them wished to remain anonymous. Ald. Scott Waguespack of the 32nd ward, who was a frequent ally of Fioretti's in City Council, also expressed his opposition to Fioretti's endorsement and said he was staying by Garcia's side in the voting booth. "Ald. Fioretti and I have been friends and colleagues for many years, and we have stood up together against the Emanuel administration's bad choices, wrong priorities and broken promises," Waguespack said in a statement. "And, together, we have voted against the last three irresponsibile Emanuel administration budgets." Fioretti acknowledged his past disagreements with the mayor, but he said his endorsement wasn't about those issues. "My endorsement is about which of these two candidates is ready and able to take on the tough financial challenges this city faces. For me, that candidate is Rahm. And on Election Day I will be casting my vote for Rahm," Fioretti said. The alderman did not seek re-election after the new ward map pushed him outside of the second ward boundaries. Instead, he decided to challenge Emanuel, who pushed for the remap, in the mayor's race. A spokesperson for Fioretti, however, said there was no personal financial incentive for the alderman in endorsing Emanuel. "People are going to make up all kinds of stories of what Bob is getting," the spokesperson told NBC 5. "Honestly, he is getting nothing. He and Rahm disagree on a lot of issues, but his endorsement is simply about the financial solvency of the city. Bob has more faith in Rahm to handle it." Fioretti received 7 percent of the vote in the Feb. 24 election.